Too often these days a bull with a pretty picture is no more than that. Spartan's ideal phenotype is difficult to capture even on film. No need for enhancement here, his rib and hind leg set is superb and in terms of balance and front end quality you just have a hard time wanting him to be any better. He has no holes genetically either. Genotypically, Spartan ranks in the top 15% of all SimAngus for the 10 most crucial value EPD categories including those predicting calving ease, growth performance, maternal and terminal value traits. 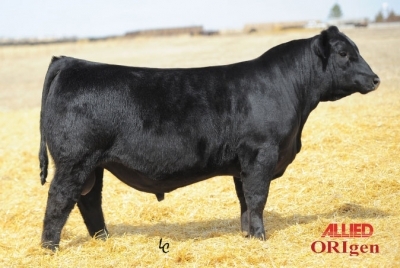 Just like CCR Gravity and CCR Wide Load bulls, he was a feature of the 2014 Cow Camp bull sale and just like them he is out of "Apple" (CCR MS Apple 9332W). She is a great cow and Spartan looks to be a great SimAngus bull. 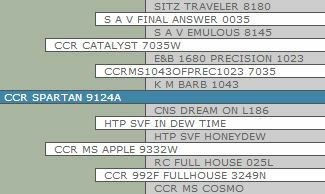 His sire CCR Catalyst was as good a Final Answer son as you will ever find with a remarkable performance proof. Catalyst has been found to be a DD carrier and will no longer find significant use. Take advantage of Spartan's tested DD Free status to use the value genetics of Catalyst moving forward.